I love cilantro, but it's one polarizing herb. You either love it or hate it. I have heard cilantro haters describe it as tasting like "soap", "dirty diaper", or my favorite "cat pee." Really? Have you ever actual tasted any of those things? Gross. To be fair to the cilantro haters, there are theories that certain people's taste buds are predisposed to hate cilantro. Fair enough. More for me! Besides playing a major role in my most favorite cuisine (Mexican for those of you just getting to know me and my guacamole and spicy margarita obsession), cilantro has several healing properties. It aids in digestion, is anti-inflammatory, and can help with an upset stomach or nausea. This stuff is so powerful that it's anti-micorbial and antibacterial properties have taken out salmonella in a lab. Time to get rid of the sanitizing hand gel and rub cilantro on your hands instead! 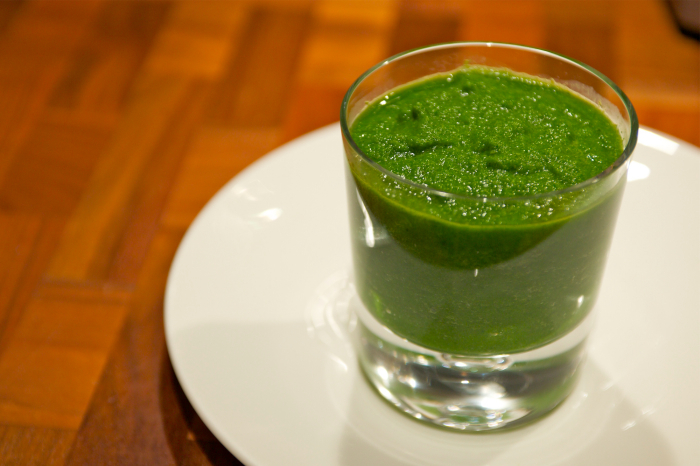 Or you could drink this smoothie to reap the delicious benefits. Combine all ingredients in a Vitamix or highspeed blender until smooth. You may need to use the tamper to get everything going.